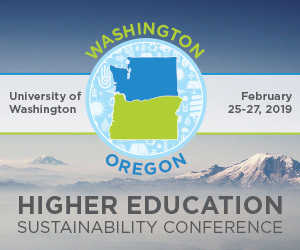 The University of Washington is hosting the 2019 Washington & Oregon Higher Education Sustainability Conference (WOHESC), February 25-27, 2019. This is the second annual WOHESC event, which brings together students, faculty and operational staff from campuses across the region, as well as community stakeholders, to advance sustainability in higher education. The conference will be held primarily at the UW's Husky Union Building, a LEED Gold facility that incorporates many sustainability features. Attendees will hear from a wide variety of sustainability practitioners in sessions, keynotes, panel discussions, workshops and more. The conference will focus on sustainability, diversity and inclusion within the region's higher education institutions. "WOHESC can be a powerful driver of change in our region," said Claudia Frere-Anderson, director of UW Sustainability and the Business Diversity Program. "By bringing together students, faculty, staff and other stakeholders to exchange ideas about the current work on sustainability, social justice and diversity, we can propel the discussions to create real, collaborative solutions to seemingly unsurmountable challenges. WOHESC elevates existing practices and while creating a new pathway for advancing sustainability and diversity in higher education." WOHESC will incorporate a regional focus, with dialogue that specifically addresses issues around sustainability in the Pacific Northwest, and solutions will be tailored for implementation in our region's unique political, social, economic and environmental climate. Students and university staff will have the opportunity to learn from and share ideas with sustainability leaders from the area, and will walk away with actionable takeaways to implement on their campuses. Registration for the conference is open now, with early pricing available until January 25, 2019. Use discount code UW2019 for a 30% discount on registration. For more information, visit wohesc.org.